A battery energiser provides an effective animal control solution for remote locations, or where there is no mains power source available. Gallagher battery powered energisers provide the reliability required for these situations. Battery powered energisers are available in 9V and 12V depending the size and type of electric fence installation required. Some 9V and all 12V energisers can also be combined with a solar power source to provide free, environmentally friendly energy for your set-up. A powerful storage battery powered energiser suitable for all kinds of animals. The control unit is separate from the battery and a carrying handle is provided that clips to the back of the unit to assist portability or to enable the unit to be hung from a wire. Battery Check: The battery charge level is displayed on the bar graph. The number of LED's illuminated provides an indication of remaining battery charge. Off: When the dial is in the vertical position, the energiser is OFF. Full Power: The energiser operates at full power. 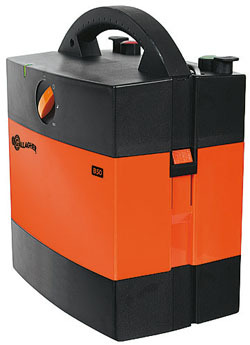 Robust battery-unit on self supporting stand with carry handle for simple installation and portability. Features 4 battery save options that can be selected using the external switch. 12V battery leads included. Built-in indicator light flashes with each pulse. 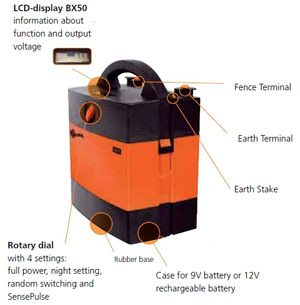 Feature-packed battery operated energiser suitable for fences up to 2Km (without vegetation growth). Very easy to use. It operates on a 9V disposable battery or a 12V rechargeable battery. The device warns you when the battery is almost flat. 55Ah battery included. The world's most energy efficient battery energizer! Only 10mA use in Random/ half power/night safe mode. This means secure animal safety and ultra low battery consumption. Earth stake and battery 120Ah included. Powerful device supplied by a 9 V disposable or 12 V storage battery. The LED shows red if the current in the fencing is too low. 3 settings: full power, night mode and random. Powerful and very complete equipment offering the latest technology. Powered by a 9 V disposable or 12 V storage battery. With LCD display for current information on the operation of the equipment and its output voltage.With battery indicator. 4 settings: full power, night mode, random and Sense Pulse. Auto-setting for 9 V disposable battery or 12 V storage battery. With connector for solar panel. Includes earth stake. 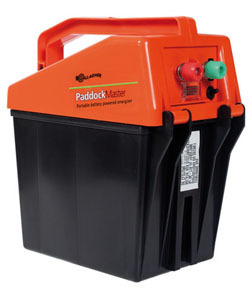 Powerful storage battery powered energiser for fencing up to 7km. Suitable for all kinds of animals. Easy to operate by turning a switch. 3 settings: off, full power and battery charge level check. LEDs for monitoring battery and output voltage: green is OK. Includes handle for carrying and mounting. Solar power option available. 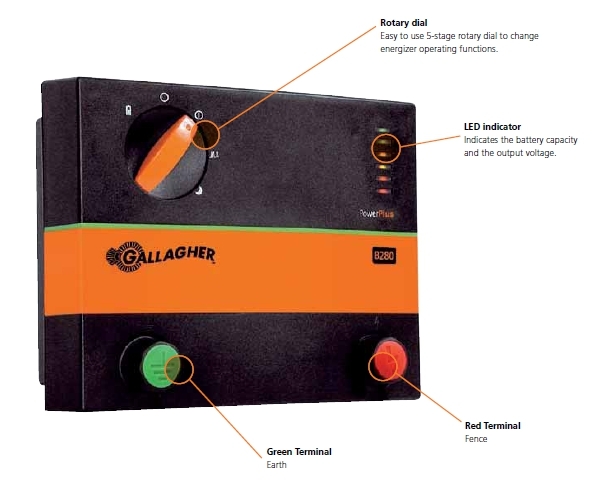 Powerful storage-battery powered energiser for fencing up to 12 km. Suitable for all kinds of animals. With integral battery-saving options. Easy to operate by turning a switch. 5 settings: OFF - battery monitor - full power - random - night mode. LEDs for monitoring battery and output voltage: green is OK. Includes handle for carrying and mounting. Solar power option available. 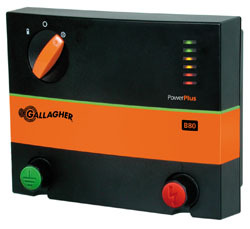 Powerful storage-battery powered energiser for fencing up to 20 km. Suitable for all kinds of animals. With integral battery-saving options. Easy to operate by turning a switch. 5 settings: OFF - battery monitor - full power - random - night mode. LEDs for monitoring battery and output voltage: green is OK. Includes handle for carrying and mounting. Solar power option available. 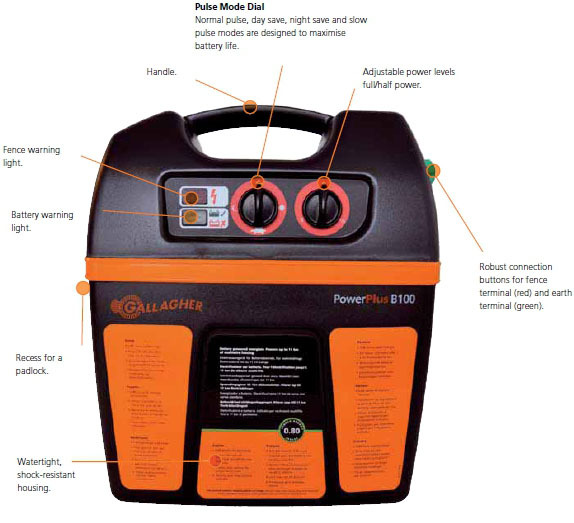 A complete 12V battery energiser with space for the battery, all in one carry case. The electronics are safely protected from the battery compartment. The energiser can be protected against theft with padlocks on either side. You can use the security kit for protecting your energiser against theft which anchors the energiser to the ground. The pulse rate is continuous. The pulse rate is halved, saving costs. Powerful battery energizer suitable for 9V and 12V battery use. Highly visible low battery and fence voltage indicator lights. Four easy to use Battery Save Options which can extend battery life by up to 12 months. Ideal in combination with solar energy. Powerful battery energiser suitable for 12V use. Highly visible low battery and fence voltage indicator lights. Four easy to use Battery Save Options which can extend battery life by up to 12 months. 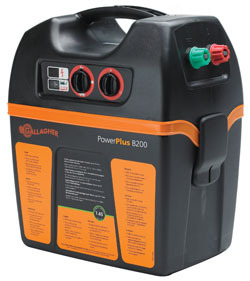 Advised battery: Gallagher 12V 85 Ah (not included). Ideal in combination with solar energy. 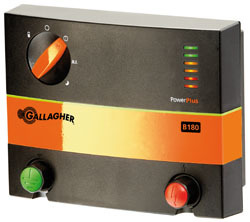 Powerful battery energiser suitable for 9 and 12V use. Highly visible low battery and fence voltage indicator lights. Four easy to use Battery Save Options which can extend battery life by up to 12 months. 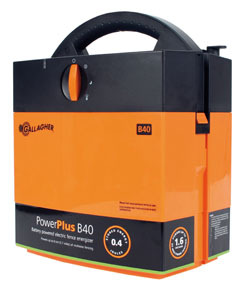 Advised battery: Gallagher 12V 85 Ah (not included). Ideal in combination with solar energy.